The Passacaglia (44 variations, cadenza and fugue on the opening theme of Schubert’s ‘Unfinished Symphony’) was completed in October 1927. It was Godowsky’s last major composition, written as a tribute to Schubert on the centenary of his death. While the variations and cadenza were composed swiftly in about a fortnight, the fugue took him several more weeks. Its completion gave him ‘new strength and a feeling of aloofness … I simply believe that [the Passacaglia] is a great expression of human loftiness. While composing it I felt that I was purifying my soul and looking closer into eternity’. Abram Chasins, who knew Godowsky well at this time, recalled in his book Speaking of Pianists the evening when he, along with a few others (including the great Josef Hofmann), gathered in Godowsky’s apartment in New York to hear the work for the first time. The composer played it from green-coloured proof sheets stacked on the piano rack. ‘And how he played! This was sheer enchantment, both the work itself and Godowsky’s pianism. It had the cool, colorful clarity of a stained-glass window. Although I was greatly moved and impressed by what I heard, Godowsky’s effortless mastery made me unaware of the vastness of his pianistic feat that night. Years later I realized it when one of the great virtuosos told me he had worked on the “fiendish piece” for a year, several hours each day, and had finally given up the unequal struggle. “It is impossible to master”, he said. I felt tactful that day and refrained from telling him with what devastating ease Godowsky had disposed of it, making it seem like nothing at all.’ Simon Barere played it, Vladimir Horowitz prepared it but never programmed it (though his reported excuse for not doing so—‘It needs six hands to play it’—is surely a comment on something other than his digital ability). Yet until recently very few had tackled it in public. 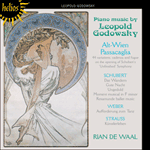 Godowsky gave its London premiere at the Queen’s Hall in April 1928; Rian de Waal gave its second London performance in April 1991. Abram Chasins, qui connaissait bien Godowsky à cette époque-là, rappelle dans son livre Speaking of Pianists le soir où, avec quelques amis (parmi lesquels le grand Josef Hofmann), ils se réunirent dans l’appartement de Godowsky pour entendre le morceau pour la première fois. Le compositeur le joua en déchiffrant des épreuves de couleur verte, entassées sur le chevalet. «Et comme il le joua! C’était un pur enchantement, à la fois pour le morceau et pour la qualité pianistique de Godowsky. Cela avait la clarté pure et colorée d’un vitrail. Bien que je fusse fort ému et impressionné par ce que j’entendais, la maitrise aisée de Godowsky me cacha l’immensité de son exploit pianistique, ce soir-là. Bien des années plus tard, je m’en rendis compte quand un des grands virtuoses me dit qu’il avait travaillé «le diabolique morceau» pendant un an, plusieurs heures par jour et avait fini par abandonner cette lutte inégale. «Il est impossible à jouer», dit-il. J’étais plein de tact ce jour-là et ne lui révélai donc pas la facilité irrésistible avec laquelle Godowsky en avait disposé, nous faisant croire que ce n’était rien. Simon Barere l’a joué, Vladimir Horowitz l’a préparé mais ne l’a jamais inscrit à son programme (son excuse pour ne pas le faire—«Il faut six mains pour le jouer»—doit certainement être un commentaire sur plus que son habileté digitale). Pourtant, très peu s’y attaquèrent en public jusqu’à une période récente. Godowsky lui donna sa première à Londres au Queen’s Hall en avril 1928; Rian de Waal lui donna sa deuxime représentation à Londres en avril 1991. Die Passacaglia (44 Variationen, Kadenz und Fuge auf das Eröffnungsthema von Schuberts „Unvollendete“ Sinfonie) wurde im Oktober 1927 fertiggestellt. Sie war Godowskys letzte umfangreichere Komposition, geschrieben als Tribut an Schubert zu dessen hundertstem Todestag. Während die Variationen und die Kadenz binnen 14 Tagen vorlagen, brauchte er für die Fuge mehrere Wochen zusätzlich. Ihre Vollendung gab ihm „neue Kraft und ein Gefühl von Distanz … Ich glaube einfach, daß [die Passacaglia] ein großartiger Ausdruck menschlicher Erhabenheit ist. Beim Komponieren kam es mir vor, als würde ich meine Seele läutern und einen genaueren Blick in die Ewigkeit werfen“. Abram Chasins, der damals gut mit Godowsky bekannt war, erinnert sich in seinem Buch Speaking of Pianists an den Abend, als er und einige andere (darunter der große Josef Hofmann) in Godowskys Wohnung in New York zusammenkamen, um das Werk zum ersten Mal zu hören. Der Komponist spielte es mit Hilfe der grünen Probeabzüge, die sich auf der Notenablage stapelten. „Und wie er spielte! Das war reine Zauberei, sowohl das Werk selbst, als auch Godowskys Klavierspiel. Es hatte die kühle, farbige Klarheit eines Buntglasfensters. Obwohl ich von dem, was ich hörte, sehr bewegt und beeindruckt war, ließ mich Godowskys mühelose Meisterschaft die ungeheure pianistische Leistung übersehen, die er an jenem Abend vollbrachte. Jahre später kam mir die Erkenntnis, als mir ein bedeutender Virtuose anvertraute, er habe an dem ‘teuflischen Machwerk’ ein Jahr lang mehrere Stunden täglich gearbeitet und schießlich den ungleichen Kampf aufgegeben. ‘Es ist unmöglich zu bewältigen’, sagte er. Ich war damals taktvoll und enthielt mich, ihm von der erschütternden Leichtigkeit zu erzählen, mit der Godowsky es heruntergespielt hatte, als wäre nichts dabei.“ Simon Barere spielte es, Wladimir Horowitz übte es ein, setzte es jedoch nie als Programmpunkt an (seine angebliche Entschuldigung, es nicht zu tun—„Man braucht sechs Hände, um es zu spielen“—, bezieht sich gewiß auf etwas anderes als auf die eigene Fingerfertigkeit). Jedenfalls hatten es bis vor kurzem nur sehr wenige vor Publikum angegangen. Godowsky spielte im April 1928 in der Queen’s Hall die Londoner Uraufführung und Rian de Waal gab im April 1991 die zweite Aufführung überhaupt in London. While I wrote at Atlantic City 44 variations and a Cadenza in about a fortnight [completed on 25 September], it took me weeks to write here [in New York] the Fugue which closes the Passacaglia. It is my most important work since the Sonata (17 years ago! ), is considerably more mature (no wonder!) and touches depths which only intense suffering can produce—but there is emancipation and defiance in it. The Passacaglia gave me new strength and a feeling of aloofness. I hope you will not interpret this as a gesture of conceit or bravado. I simply believe that my latest work is a great expression of human loftiness. While composing it I felt I was purifying my soul and looking close into eternity. Schubert had preoccupied Godowsky’s thoughts during the previous year—he had transcribed twelve of Schubert’s songs for piano solo during the latter part of 1926. The principal inspiration for the Passacaglia was the imminent centenary of Schubert’s death in November 1828 (‘a heartfelt tribute to this precious and prolific genius who, despite his short and uneventful life, succeeded so admirably in transforming our innermost emotions into music’, wrote Godowsky in his introduction to the published score). The work received its premiere in April 1928 at Queen’s Hall, London. 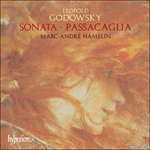 ‘Although Godowsky’s extraordinary Passacaglia has had a number of performances in the last couple of decades, it will be some time before it is recognized for what it is’, writes Marc-André Hamelin. ‘Some of its daunting reputation stems from an unfortunate and rather silly remark that Vladimir Horowitz once made [see below]. A look at the score reveals that, although admittedly greatly demanding, the work is certainly not out of reach pianistically, and more pianists should be encouraged to discover this noble and majestic creation. The range of invention displayed throughout this weighty and reverential tribute is enormous. Godowsky employs a good variety of textures and harmonic activity, as well as some very imaginative counterpoints. These devices help in overcoming what some would consider a weakness, namely the fact that, save for one variation, the entire passacaglia portion of the work never moves away from B minor or major. The composer Kaikhosru Sorabji thought enough of the Passacaglia to write (in Mi Contra Fa, Porcupine Press, London, 1947) that it deserved a place alongside a work such as Reger’s Bach Variations, Op 81, even stating that Godowsky’s opus “far surpasses [Reger’s] in sustained pianistic interest and variety of treatment”. This statement’, Hamelin continues, ‘should more than sufficiently prepare listeners for this monumental work, an endlessly fascinating and totally unique exploitation of the limitless possibilities of variation form’. I am constantly in a state of depression. I really think there is no purpose that we, mortals, can find in our being here and having all those terrifying puzzling things around us and about us. Why? Wherefore? What do even the sublimest efforts of mortal geniuses amount to in the scheme of Cosmic phenomena? In recent years the Passacaglia has occasionally been heard in concert, and a handful of recordings have appeared—including an earlier one by Marc-André Hamelin for Les entreprises Radio-Canada / CBC Enterprises. Few pianists from previous generations concerned themselves with it. Simon Barere was one notable exception and his erstwhile classmate Vladimir Horowitz went so far as to prepare it for performance. Horowitz’s reported excuse for abandoning it (‘It’s hopeless! You need six hands to play it’) sounds utterly implausible from an artist with such a formidable technical powers. It is a remark quoted by Godowsky’s daughter Dagmar in her highly imaginative memoirs First Person Plural (The Viking Press, New York, 1958). When we realize that Horowitz never once programmed a piece of Godowsky’s music, we may draw our own conclusions as to why he deserted the Passacaglia. In any case, such an excuse would certainly not have pleased Godowsky. It angered him to hear criticism of his work based on its sheer difficulty. ‘My music is not difficult’, he told one reporter. ‘Some of it is hard to read perhaps, but I insist that it is not difficult to play. I have small hands and I write my music so that it is pianistic—to fit the hand.’ What particularly irritated him, as expressed in a letter written towards the end of his life, was that ‘too many pianists were too indolent mentally and physically to make the supreme effort. My compositions have such a personal idiom, involved inner voices, complicated contrapuntal and polyrhythmic devices, sonorities of a new kind, that the hoi-polloi of pianists keep away from them’. And how he played! This was sheer enchantment, both the work itself and Godowsky’s pianism. It had the cool, colorful clarity of a stained-glass window. Although I was greatly moved by what I heard, Godowsky’s effortless mastery made me unaware of the vastness of his pianistic feat that night. Years later I realised it when one of the greatest virtuosos told me that he had worked on the ‘fiendish piece’ for a year, several hours each day, and had finally had to give up the unequal struggle. ‘It is impossible to master’, he said. I felt tactful that day and refrained from telling him with what devastating ease Godowsky had disposed of it, making it seem like nothing at all. Si j’ai pu écrire à Atlantic City 44 Variations et une Cadenza en une quinzaine de jours [achevées le 25 septembre], il m’a fallu des semaines pour finir ici [à New York] la Fugue qui conclut la Passacaglia. Il s’agit de ma composition la plus importante depuis la Sonate (il y a déjà 17 ans!). Elle atteint une maturité nettement plus grande (pas étonnant!) et des profondeurs que seule une intense souffrance peut produire—mais elle contient aussi un sentiment d’émancipation et de défi. La Passacaglia m’a donné des forces nouvelles et une certaine distanciation. J’espère que tu ne l’interpréteras pas comme un geste de vanité ou de bravade. Je crois simplement que ma dernière œuvre est une véritable expression de la noblesse humaine. Lors de sa composition, j’avais l’impression de purifier mon âme et de scruter l’éternité. Schubert avait imprégné les pensées de Godowsky durant toute l’année précédente—il avait transcrit douze des mélodies de Schubert pour piano seul durant la seconde moitié de 1926 L’inspiration principale de la Passacaglia se trouve être le centenaire imminent de la mort de Schubert, en novembre 1828 («un hommage sincère à ce génie précoce et prolifique qui, en dépit d’une vie courte et monotone, parvint à transformer admirable­ment nos émotions les plus profondes en musique», écrivait Godowsky dans son introduction à la partition.) L’œuvre reçut sa première audition en avril 1928 au Queen’s Hall, à Londres. Je suis dans un constant état de dépression. Je crois vraiment qu’il n’y a aucun but que nous, mortels, puissions trouver dans ces choses ici bas et dans toutes les choses terrifiantes et saisissantes qui nous entourent. Pourquoi? Où? Que représentent les efforts, même les plus sublimes, de génies mortels face à l’échelle du schéma et phénomène cosmiques? Et comme il jouait! C’était un véritable enchantement, aussi bien l’œuvre en soi que le jeu de Godowsky. Il possédait la clarté froide et colorée des vitraux. Si j’ai été profondément ému par ce que j’ai entendu, l’aisance magistrale de Godowsky au piano m’a laissé inconscient de l’immensité de la fête pianistique à laquelle j’avais assisté ce soir-là. Des années plus tard, je m’en suis rendu compte lorsqu’un des plus grands virtuoses me confia qu’il avait travaillé à cette «pièce démoniaque» pendant un an, plusieurs heures par jour, et qu’il avait finalement renoncé devant cette lutte inégale. «Elle est impossible à maîtriser» me dit-il. Ce jour là, j’ai été diplomatique et je me suis retenu de lui dire avec quelle aisance dévastatrice Godowsky l’avait exécutée, donnant l’impression que ce n’était rien du tout. Während ich in Atlantic City innerhalb von etwa vierzehn Tagen vierundvierzig Variationen und eine Kadenz schrieb [beendet am 25. September], brauchte ich hier [in New York] Wochen, um die Fuge zu komponieren, die die Passacaglia abschließt. Sie ist mein wichtigstes Werk seit der Sonate (und die liegt siebzehn Jahre zurück! ), sie ist beträchtlich reifer (kein Wunder!) und dringt in Tiefen vor, die nur intensives Leid hervorbringen kann—aber es gibt auch Emanzipation und Herausforderung in ihr. Die Passacaglia hat mir neue Kraft und eine gewisse Distanz vermittelt. Ich hoffe, du wirst dies nicht als eine dünkelhafte oder überhebliche Geste interpretieren. Ich glaube einfach, daß mein neuestes Werk die menschliche Erhabenheit großartig ausdrückt. Während seiner Komposition hatte ich das Gefühl, meine Seele zu läutern und über die Schwelle zur Ewigkeit zu blicken. Godowsky hatte sich schon während des vorhergehenden Jahres mit Gedanken an Schubert beschäftigt—in der zweiten Jahreshälfte 1926 hatte er zwölf Schubert-Lieder für Soloklavier transkribiert. Die Hauptinspiration für die Passacaglia war die unmittelbar bevorstehende hundertste Wiederkehr von Schuberts Todestag im November 1828 („ein tiefempfundener Tribut an dieses kostbare und fruchtbare Genie, dem es trotz seines kurzen und ereignislosen Lebens so bewundernswert gelang, unsere innersten Gefühle in Musik zu verwandeln“, schrieb Godowsky in seiner Einleitung zur gedruckten Partitur). Das Werk wurde im April 1928 in der Londoner Queen’s Hall uraufgeführt. Ich bin in einem Zustand ständiger Depression. Ich finde wirklich, wir Sterblichen können keinen Sinn in unserem Dasein finden und haben doch all diese furchterregenden und rätselhaften Dinge um uns und über uns. Warum? Weshalb? Was zählt schon die unglaublichste Anstrengung eines sterblichen Genies im Ablauf der kosmischen Ereignisse? Und wie er spielte! Das war reines Entzücken, sowohl das Werk selber als auch Godowskys Klavierspiel. Es hatte die kühle, farbenfrohe Klarheit eines Buntglasfensters. Obwohl ich von dem Gehörten zutiefst bewegt war, ließ mich Godowskys mühelose Meisterschaft an jenem Abend das wahre Ausmaß seiner pianistischen Leistung vergessen. Jahre später wurde es mir deutlich, als einer der größten Virtuosen mir erzählte, er habe ein Jahr lang täglich mehrere Stunden an dem „höllischen Stück“ gearbeitet und schließlich den ungleichen Kampf aufgeben müssen. „Es ist unmöglich zu meistern“, meinte er. Damals war ich taktvoll und unterließ es, ihm zu erzählen, mit welch überwältigender Leichtigkeit Godowsky darüber verfügt hatte, so daß es gar nicht als etwas Besonderes erschien.